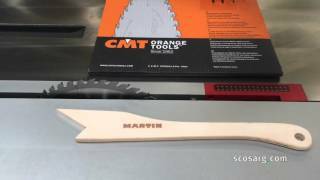 The Martin T60A saw is the perfect entry point into the world of MARTIN saws. It makes your work, as you would expect from a MARTIN precise and reliable. You will be impressed by its quiet running saw blade, the precisely guided sliding table or the rip fence which is superb to operate. At the same time the compact construction also ensures high effectiveness even in smaller rooms. 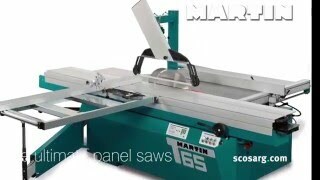 The T60A is a German designed and manufactured sliding table panel saw from the worlds leading manufacturer, Martin. Although it is the entry model in the range it still has the same precise 'Martin Design' sliding table as on the very top model, ensuring long term repeat cutting accuracy and reliability. Standard features include powered rise / fall / tilt of the sawblade with digital display of the cutting angle. 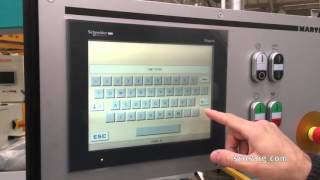 The machine can be supplied the optional electrically adjustable 2 axis scoring unit. The standard blade size is 315mm although most people choose the optional 'cutting height package' which includes a 400mm blade, overhead guard and larger motor power. Don't compromise, decide on quality from MARTIN right from the start. With the extensive range of MARTIN accessories, your machine can be perfectly adapted to the task at hand. 120 mm ¥ saw blade, 22 mm ¥ bore.